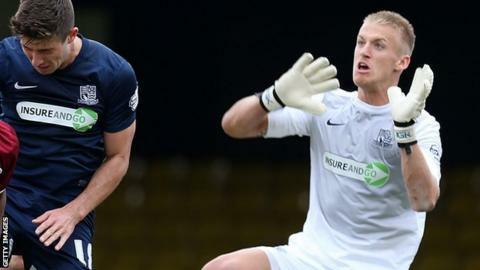 Southend keeper Daniel Bentley has said he is not being distracted by reports linking him with a January move. QPR, Brentford, Nottingham Forest and Bristol City are reportedly interested in the 21-year-old, who has conceded once in his last five games. "There's been a bit of speculation. I don't think you'd find a player in the dressing room who doesn't want to play at a high level," he told BBC Essex. "But I'll leave that to the powers that be and I'll focus on my job." Bentley, a Shrimpers youth product, has not missed a league game since April 2013 and has made 92 appearances since his debut in 2011. He is halfway through a three-year deal at Roots Hall. Meanwhile, boss Phil Brown expects to bring in more loan signings, with Charlton striker Joe Piggott arriving in time for Saturday's 0-0 draw with Plymouth. "I was hoping to get one more in before the game and would have thrown him straight in too," said Brown. "The players at the club have to understand I'm not going to sit around for more 0-0 draws."